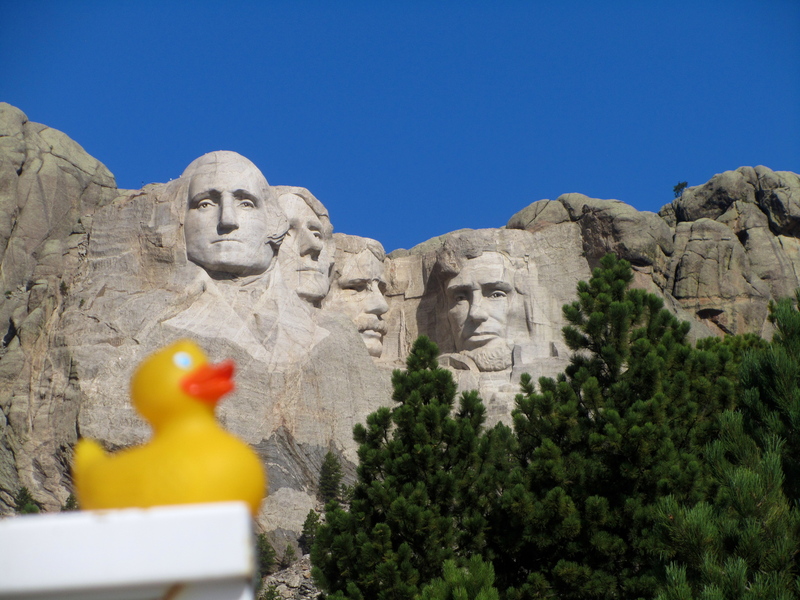 We, the Colorado Traveling Ducks, wish you all a very Happy President’s Day. 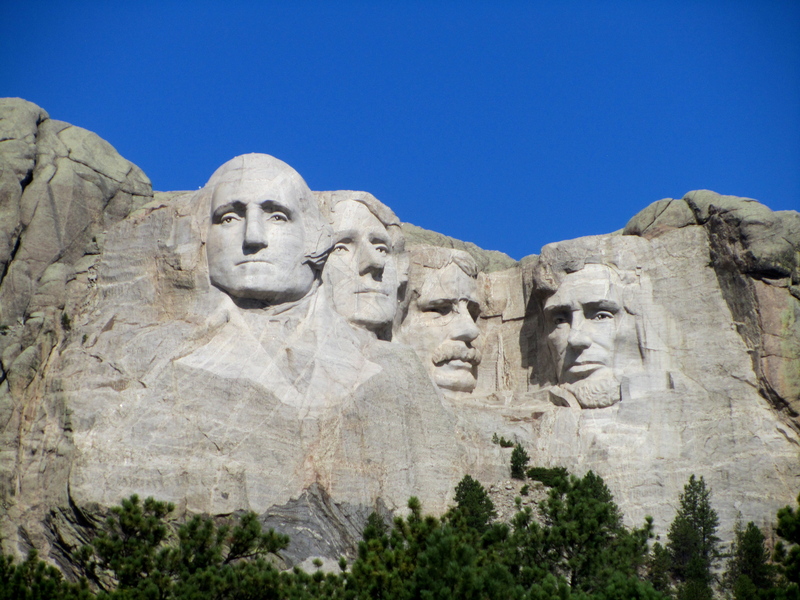 Mount Rushmore has heads of four presidents, George Washington, Thomas Jefferson, Theodore Roosevelt and Abraham Lincoln. This holiday was originally created in 1885 to recognize the birthday of President George Washington on February 22. In 1971 the holiday, under the Uniform Monday Holiday Act, was changed to the third Monday in February and now honors all presidents. through Newcastle, Wyoming. Hills, trees and meadows were everywhere. It was beautiful. But, soon it started to rain and then small hail. 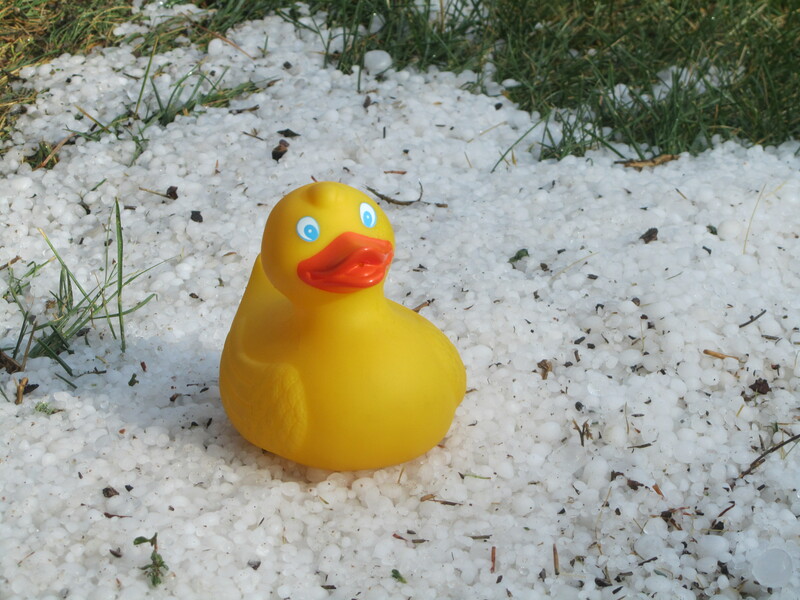 Here I am sitting in hail. Mom, we have to talk about where you put me. 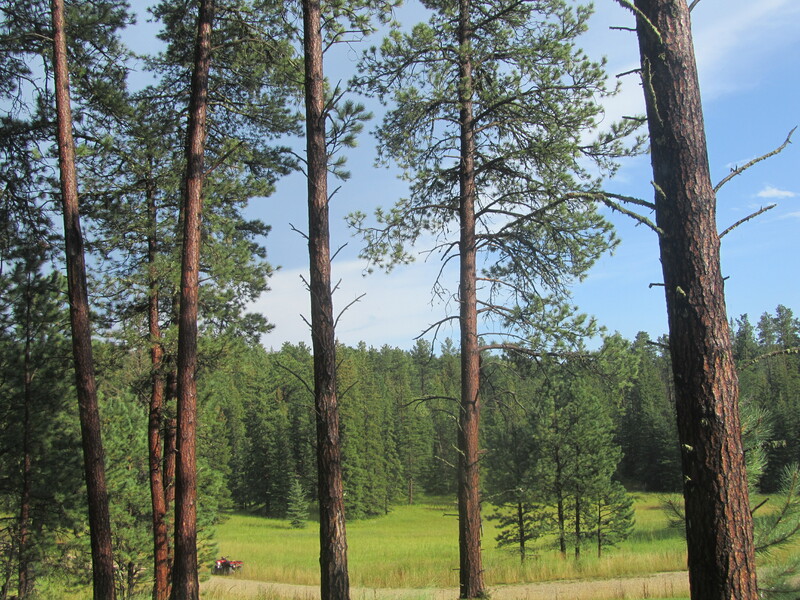 We arrived in the evening, staying in Spearfish. Yep, that is how it got its name. 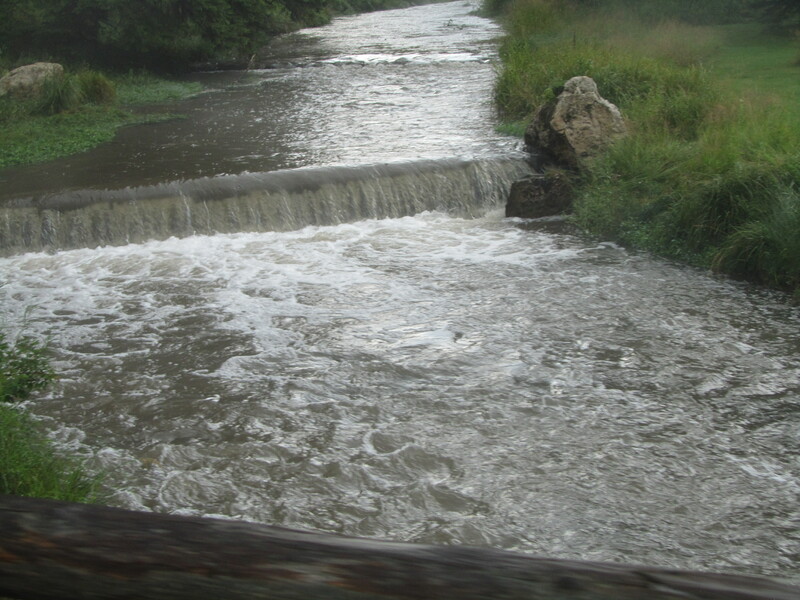 People used to spear fish in the river. 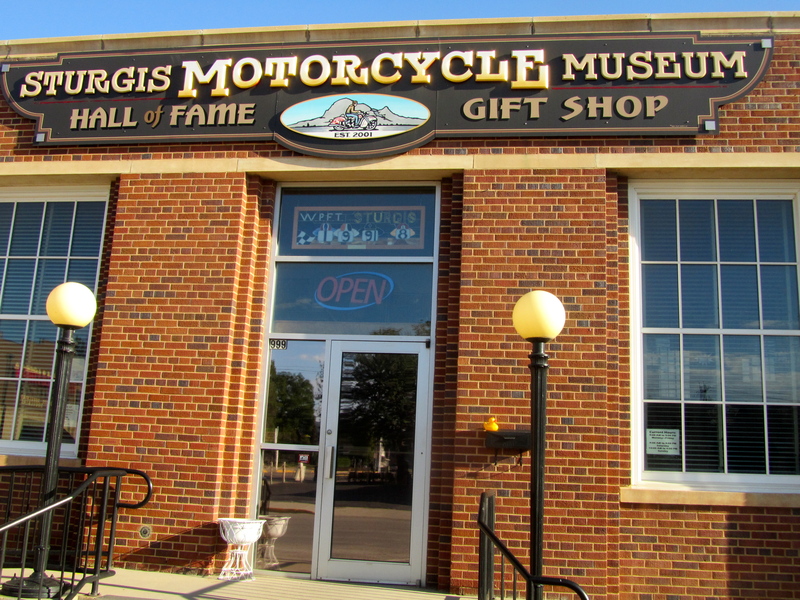 In the morning we went to Sturgis. 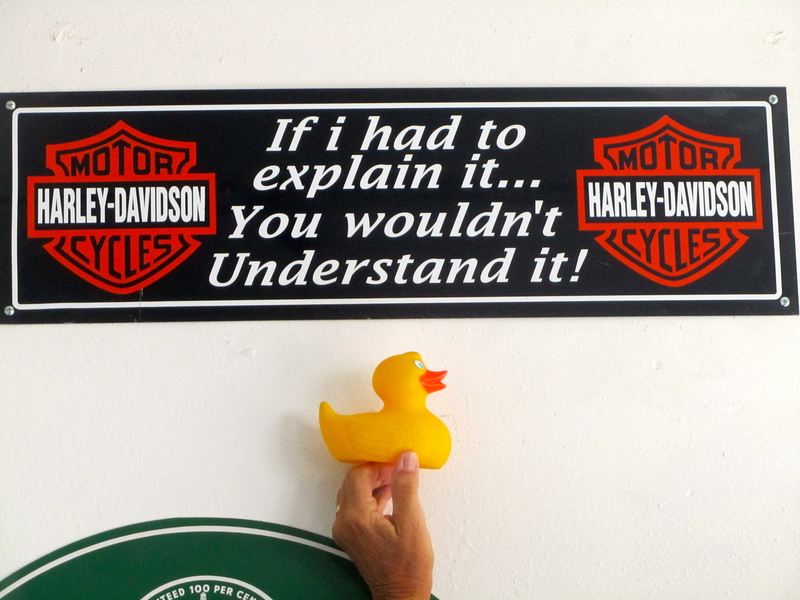 You know, the motorcycle place. 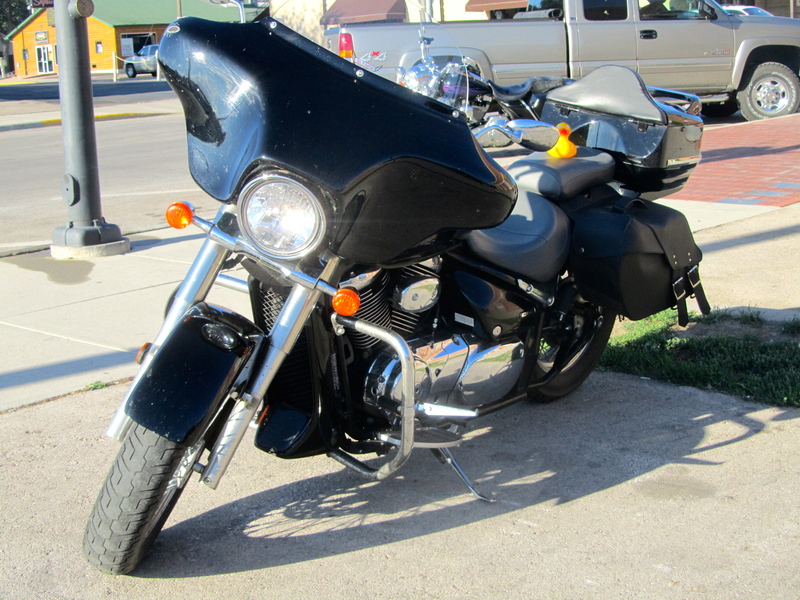 We were there last week, in early September, so the motorcycle rally was over. But, still some bikers there as the weather was beautiful. The motorcycle museum is really cool. 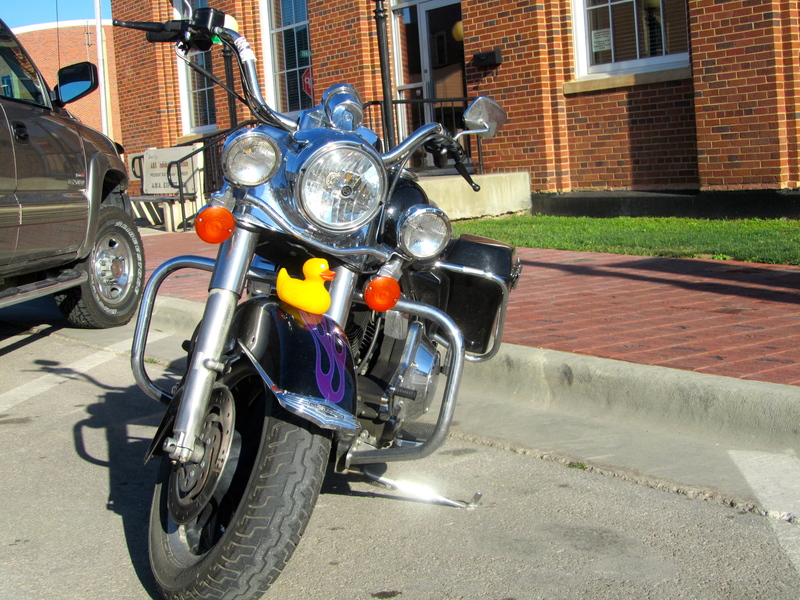 And, I Zeb, the duck, sat on some motorcycles outside. Some day I may ride. 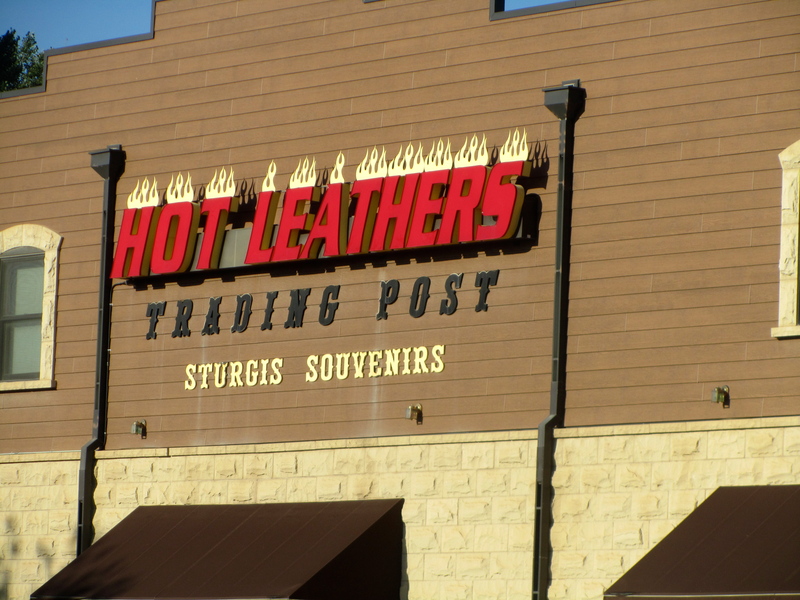 Then there was this crazy store, Hot Leathers Trading Post. Lots of hot leather stuff. Makes my heart race. 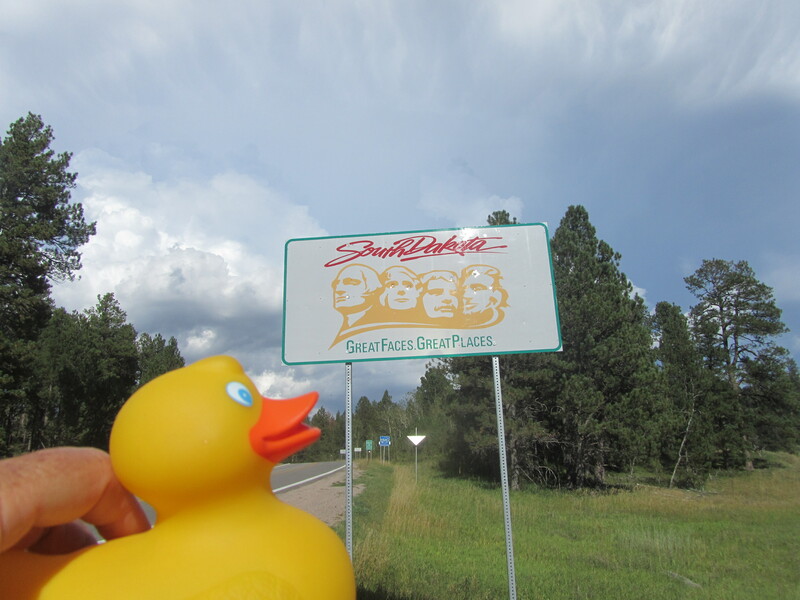 Next we went to Mount Rushmore. This is a National Monument, not a National Park. Four giant heads carved in the mountain. This is a monument to four U.S. Presidents: George Washington, Thomas Jefferson, Theodore Roosevelt and Abraham Lincoln. Admission is free but parking, which is necessary is $11 for a car. Being rather small myself, I found some facts fascinating. Washington’s nose is 21 feet long. The other noses are only (?) 20 feet long. The eyes are 11 feet wide. 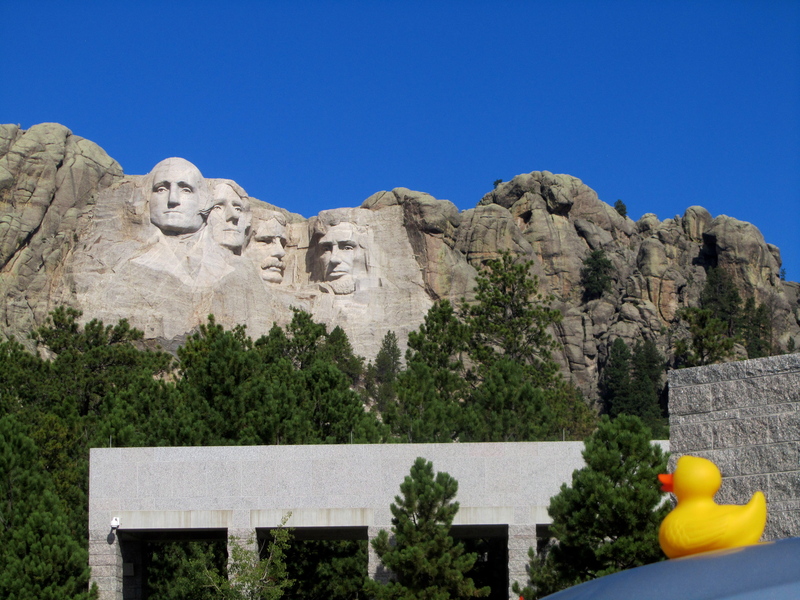 Some say that we ducks have wide mouths, but these presidents have mouths 18 feet wide. The carving, started in 1927 and ended in 1941, needed 400 workers, used dynamite as the primary tool and cost $989,992.32. That is an exact figure—great accounting. This monument means democracy. 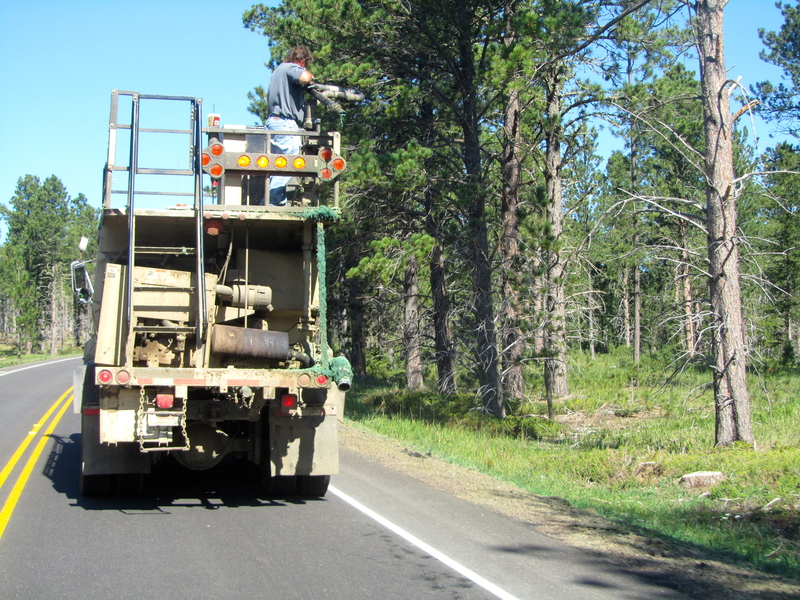 As we left Mount Rushmore, we saw a huge piece of heavy machinery on the road in front of us. They were shooting seed out a pipe at the top of the vehicle. We believe it was grass seed or some seed to plant vegetation along the shoulder of the road. Mom had never seen one before and, of course, neither had I. Was interesting to see. and this is a wonderful setting for a monument to democracy in our country. I hope all of you go to see it. We thought it was great! Next time I will tell you about our day in Deadwood. Look for me on Wednesday.